Baby food first. 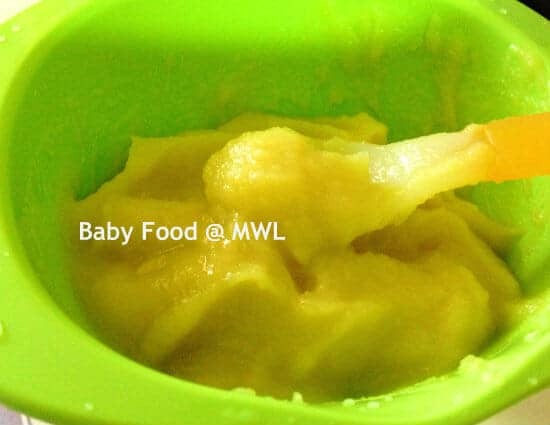 I have posted the fruit puree, but not vegetables, and my baby is going on thicker texture now. Hence, without further delay, I better post this first, before getting too far apart from my baby’s recent progress. Method: Wash butternut squash with 1 part of vinegar mixed with 3 parts of water, rinse thoroughly. Peel the skin and remove seeds. Then, cut squash into small pieces. Place in the steamer to steam for 15 mins. Turn over to blend. I have added about 50ml of BM to it, in addition to its existing steamed water. Hence, it turns out too watery (soupy consistency). To avoid that, you may either ‘sacrifice’ the steamed water or omit adding of milk (or do partially). This is the non-blended version. 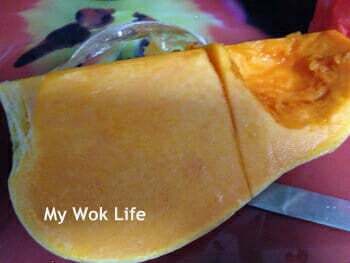 I simply steamed and mashed the butternut squash. Then, add it to barley cereal with BM. This is good for baby who starts learning to chew, from about 7 months old. 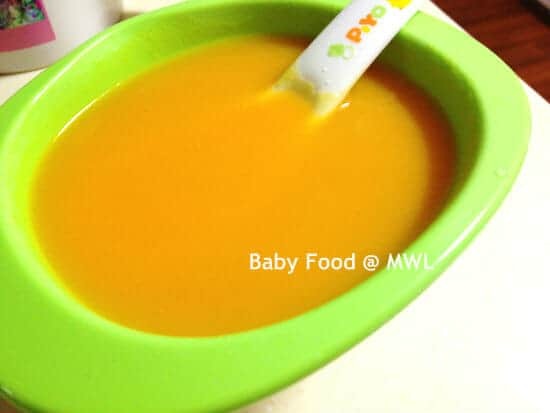 Use of butternut squash is better than pumpkin, for baby, simply because of its guaranteed (natural) sweetness as compared to using pumpkin which appears less sweet and aromatic at times. I used Organic butternut squash. Method: Wash sweet potato with 1 part of vinegar mixed with 3 parts of water, rinse thoroughly. Peel the skin and cut into small pieces. Place in the steamer to steam for 15 mins. Turn over to blend. Method: Wash peas with 1 part of vinegar mixed with 3 parts of water, rinse thoroughly. Peel open the pod to extract the peas inside. Steam the peas for just 3 minutes, turn over the jar to blend. If using frozen peas, simply rinse the peas with cooked water, followed by steam (for 5 minutes) and blend. As the fresh peas plucking from pods were so little, it wouldn’t be enough to cook as a meal on its own. I combined it with little of rice cereal whenever I cook peas. 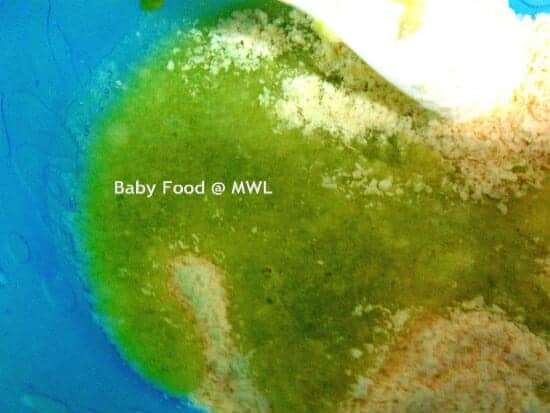 :) *Above pic shown pea purée and rice cereal before mixing. 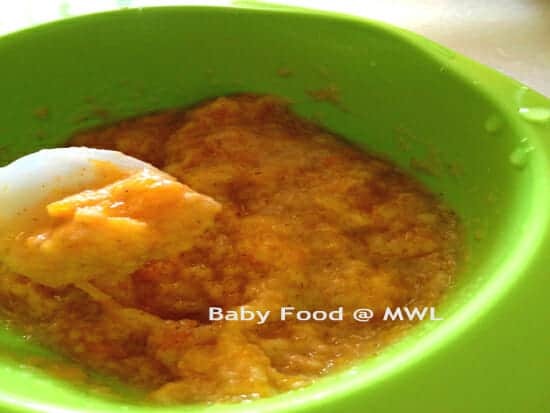 The coming post on baby food, I would like to share with you my choice of baby rice or grain cereal and how I combine fruit/ vegetables purée with the cereal.